Henrietta Lacks is one of those people who greatly impacted your life and you don’t even know her name. What’s even more fascinating about her story is that she didn’t even know how much good she would do in the world after she died. In 1951, after having five children, Lacks discovered that she had cervical cancer, from which she would pass away at a tragically young age of 31. Without the knowledge of Henrietta or her family, tissue from the tumor that killed her was taken from her body and essentially made immortal at Johns Hopkins. For decades, scientists there had been trying to grow a cell line on which the medical industry could experiment in ways that they couldn’t do with living people. Henrietta Lacks was the key that unlocked the door, leading to decades of medical advancements, including developments in the treatment of polio, Parkinsons, influenza, leukemia, and many more. With the cells named HeLa, most of the world had no idea that it was the biological property of a Virginia mother who changed the world. George C. Wolfe’s “The Immortal Life of Henrietta Lacks,” premiering on HBO tomorrow night, tells Henrietta’s (Renee Elise Goldsberry) story. Sorta. It also tells the story of journalist Rebecca Skloot (Rose Byrne), the woman who spent a decade researching this strange story and wrote the bestselling book on which this film is based. Sorta. It also tells the story of Deborah Lacks (Oprah Winfrey), Henrietta’s daughter, who has become somewhat obsessed and damaged by the saga of her mother and how little she feels like she knows about a woman who has somehow become the property of the world. Any one of these stories could have worked on their own, but the awkward blending of all three doesn’t work. Rebecca becomes little more than an unnecessary sounding board for Deborah, who could have anchored the story on her own. And, worst of all, it feels like we get to know the woman writing this tale more than the person it’s about. At one point, someone says “This story is crazy enough for three books!” Which makes it both too much and not quite enough for one film. The Lacks family saga is an amazing one. Not only did Henrietta grow up a young mother without much to her name, but her family tree developed fascinating subplots after her death. Deborah’s obsession with her mother makes her the natural leading lady of this story, but we also meet the aggressive Zakariyya (Reg E. Cathey), a man hardened by a criminal lifestyle into which he might not have fallen if he knew more about his mother. The entire Lacks family becomes bitter and angry over a system that essentially took part of a mother they never really got to know, without anyone’s permission. They became downright paranoid about it, convinced both that John Hopkins had made millions to which they were owed and even that they might have cloned Henrietta. Courtney B. Vance appears as a slimy attorney who tries to take advantage of the Lacks’ family drama. If it sounds like a lot of movie for 91 minutes, you’re not wrong. There is a socially relevant subtext here about how easy it was for the medical industry to take advantage of minorities, and often for little reason at all, other than they could. Would Henrietta Lacks have given her cells for research? Probably, but no one even asked. And John Hopkins would continue to deceive the Lacks family. Wolfe's movie seeks to humanize someone who became immortal. It takes someone who became huge in the world of science and shows us who she was, the life she led, and the family she left behind. Then why isn’t this her story? We see flashbacks to Henrietta, but Wolfe and his team chose to make this the story of a daughter “finding” her mother instead, and it truly feels like we never really find Henrietta as viewers. It’s about a woman who never knew her mother, and so it feels like something that was given to the rest of the world was stolen from her. That’s powerful drama, but the storytelling approach here diffuses it. Nothing feels invested in long enough to register because the narrative is constantly jumping around, almost as if it’s scared there’s not enough story here to carry a film. Thank God for great casting. Winfrey is typically fantastic, finding the emotional undercurrent of a child who just wants to hold on to what she can when it comes to her mother. Cathey and Vance are spectacular in small roles. Only Byrne seems adrift, but that’s a problem of direction and writing. Typically underrated, she is sometimes downright distracting here, giving an overdone performance designed to be the straight man to the oddity of Deborah. As great as it is that Rebecca helped bring this story into the light, her story is thin, and not only because it once again feels like we’re hearing the story of a minority family through the eyes of a white protagonist. Henrietta Lacks was a mortal. She was a sister and mother who died way too young, and did more for the world after she died than she ever could have imagined. 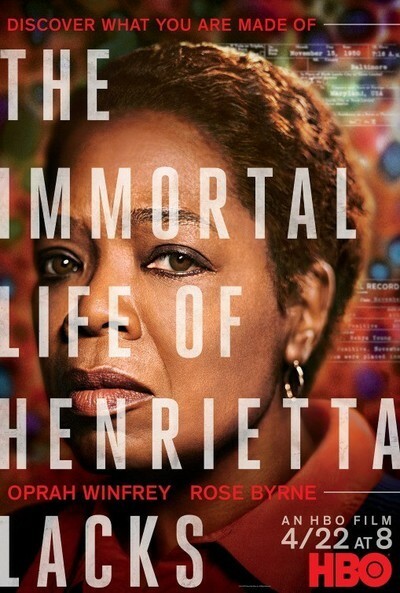 “The Immortal Life of Henrietta Lacks” does its most good by bringing the full name back to HeLa. With such a unique, decades-long story, perhaps it’s only appropriate that it’s going to take more than one movie before we really get to know her.